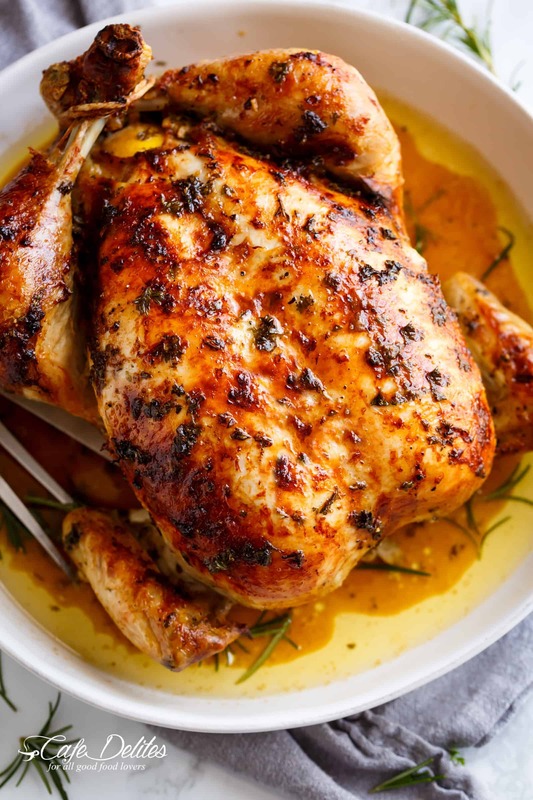 Garlic Herb Butter Roast Chicken packed with unbelievable flavours, crispy skin, and so juicy! 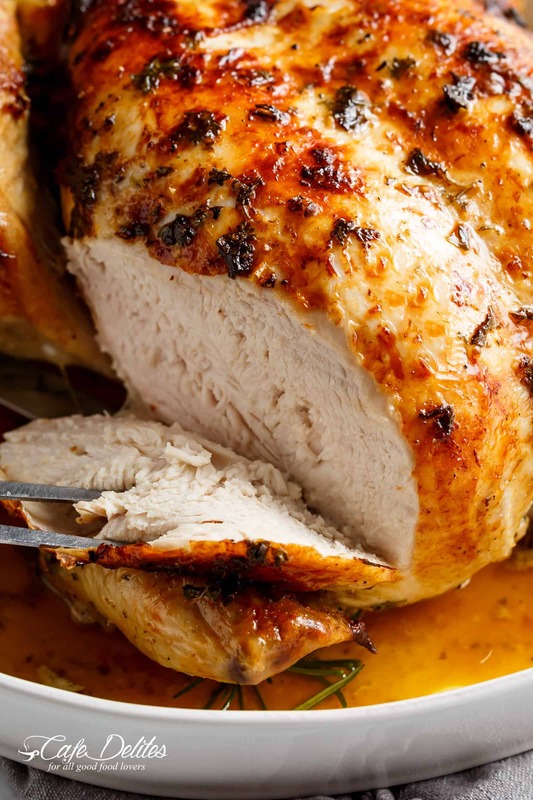 Nothing beats an easy to make and even easier to prepare roast chicken! Especially when roasted with garlic butter, rosemary, parsley, lemon, and a hint of white wine for an unbeatable flavour. This Garlic Herb Butter Roast Chicken definitely beats the pants off of any rotisserie chicken! When we roast a bird, we don’t do it with just a sprinkling of salt. No no no…we do it FLAVOUR. There is so much of it in this chicken that beats any restaurant chicken. Easy to find ingredients you have in your fridge or pantry. Not only does this recipe give you a roast chicken with flavour… it delivers crispy skin, juicy meat and a nice dinner to go with the ultimate creamy mashed potatoes. The following steps makes this baked whole chicken stand out from the rest! Rinse and pat dry chicken with paper towel. Combine olive oil, melted butter, wine (if using) and lemon juice together, rubbing all over the chicken, under the skin and inside the cavity. Season chicken outside and inside with salt, pepper and parsley. Don’t be afraid to use generous amounts! Rub the minced garlic over the chicken and under the skin. I do this separately as the last step to maximise the garlic taste. Stuff the garlic head into the chicken cavity along with the rosemary sprigs and the squeezed lemon halve. You can also use sprigs of Thyme or any other herb. Roast, basting half way through cooking time, until cooked through. Broil until golden and crispy! I like to go in the carcass, over the chicken and under the skin with all of my ingredients to ensure maximum taste. You want every inch covered in flavour. How long to roast a chicken? Over one hour, depending on the size of your bird. This 4 pound (2kg) bird took one hour and 20 minutes cooking time, then a resting time of 10 minutes to keep all of those juices in before slicing. Usually I’ll pass on chicken breasts because juicy crispy chicken legs are my favourite! BUT! In this recipe? I eat it ALL. The breasts come out so moist. NO dry meat happening on this plate! Do you see that crispy skin happening down there? ↓ That’s the part we fight over at the table. PLEASE tell me we are normal and your family fights over crispy skin too? SOOOO soft and juicy inside! Mashed potatoes. Hands down I am a full blown mashed potato and roast chicken person. Slow Cooker Mashed Potatoes, Brown Butter Mashed Potatoes OR Easy Creamy Mashed Potatoes. Pretty much anything! Add a good glass of wine. My favourite at the moment is a Chardonnay/Moscato mix. 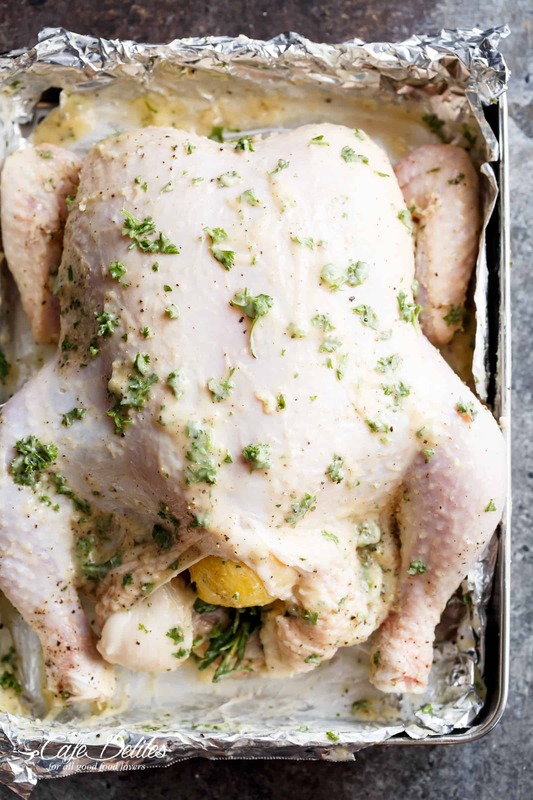 Garlic Herb Butter Roast Chicken packed with unbelievable flavours, crispy skin, and so juicy! 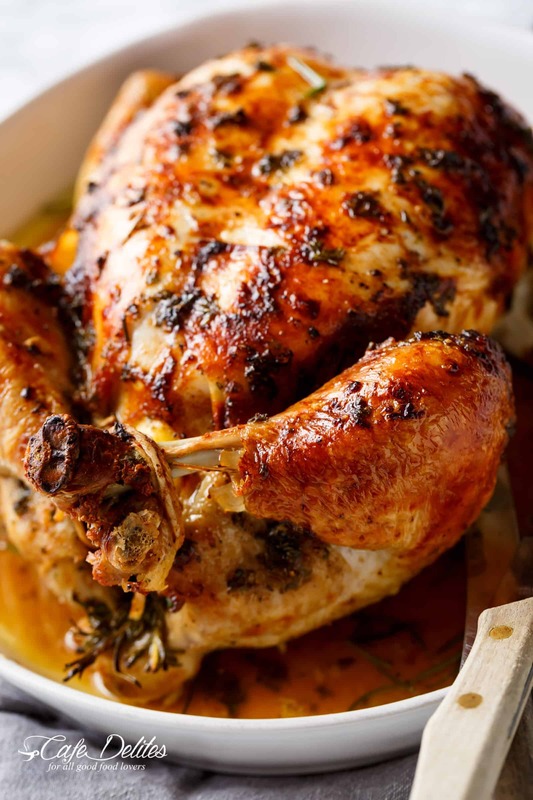 Nothing beats an easy to make and even easier to prepare roast chook! Especially when roasted with garlic butter, rosemary, parsley, lemon, and a hint of white wine. Beats any rotisserie chicken! Preheat oven to 430°F | 220°C (400°F or 200°C fan forced). Line a baking tray with foil, or lightly grease a roasting pan. Discard neck from inside the cavity and remove any excess fat and leftover feathers. Rinse chicken (including cavity) under cold running water. Pat dry with paper towels. Pour the olive oil, melted butter, wine (if using) and the juice of half a lemon over the chicken, under the skin and inside the cavity. Season chicken liberally on the outside and inside the cavity with salt and pepper. Sprinkle over the parsley. Rub the minced garlic over the chicken, mixing all ingredients together over the chicken and under the skin. Stuff the garlic head into the chicken cavity along with the rosemary sprigs and the squeezed lemon halve. Tie legs together with kitchen string. Place breast-side up into baking tray or roasting pan. Roast for 1 hour and 15-20 minutes, basting half way through cooking time, until juices run clear when chicken thigh is pierced with a skewer. Baste again, then broil for a further 2-3 minutes, until golden. Remove from the oven, cover with foil and allow to stand for 10 minutes before serving. Serve, drizzled with pan juices and remaining lemon half cut into wedges or slices. Made this last night. Its the best ever roasted chicken that tasted good and came out of oven just like in your video. This is my go-to recipe for roasted chicken. My family loved it. Thank you for posting your recipe and sharing. I was overall pretty happy with the way this turned out. I’d skip the chopped garlic on the surface of the chicken next time – due to the high cooking temp for this recipe the garlic burned and made the sauce bitter so I couldn’t use it. Other than that it was great and I’d definitely make it again. I made this for our Valentine’s Day dinner tonight and it was a hit! My husband and kids were getting tired of bland chicken. So, I started looking up recipes and came across this. It was easy to make and tasted delicious! This will definitely be a staple meal for my family and I from here on out. This recipe is amazingly good. I’ve made it twice once with wine and once without – both so moist and yummy but I will continue making it with wine in the future. I also baked chicken legs with the same recipe and they were equally as good! All around a wonderful recipe – thank you! I don’t really like to put comments in any review…But this one is si delicious recepi First time I made my chicken perfectly cook and not dry.I definitely well cook this recepi again…Yummy! Thank you for the recipe!! This Chicken was amazing! I didn’t have any white wine on hand, so I substituted chicken stock. Also, I added a few potatoes in the pot to cook with the chicken and they were delicious too – tasted just like Greek lemon potatoes!! This recipe is now in the regular biweekly food lineup! This recipe was great! I substituted ghee for the butter to make it whole30 compliant. Highly recommended you try this one!! I grew up on dry roasted chicken so as an adult I never cook it. I came across this recipe and loved it! Best chicken I’ve ever had, we didn’t have as many leftovers as I thought we would because it was just too good. I’m making this for dinner tonight. Yum! I made this for dinner tonight. And OMG it’s freaking amazing. I did baby carrots, onions and potatoes than placed the chicken on top. I’ll definitely be making this again,thanks for the great recipe! Hands down the best roasted chicken I’ve ever tasted. We like it so much that we’ve made it 3 times in the last month. We also made your turkey recipe for Thanksgiving along with the gravy. so good! Thanks for the great recipes! This was delicious! Thank you! I put whole carrots beside the chicken – the carrots absorbed the juices – we ate them all. The chicken cut in half looked so beautiful with the cavity grill of garlic and lemon. OH MAN! I just made this for Thanksgiving, chicken instead of turkey for turkey day, and it literally MELTED in our mouths! I’ll never eat turkey again!!! I put minced garlic in the liquid that I bathed the turkey in first, then put Italian seasonings, poultry seasonings and parsley on the outside and under skin. When I took it out, the thermometer went up okay 165 to 170 but it was ok, not over cooked. In fact there were some red/pink spots toward the back/bottom. With all the trimmings, it was tge best thanksgiving dinner EVER! This recipe looks so perfect very excited to make this for cooking my first Thanksgiving! Do you think it would be as tasty if I put stuffing into the chicken as well? Thank you! I was afraid about this recipe. The amount of butter and olive oil in a 430 degree oven made me think smoke detector and a house that stunk 4 for days. I definitely smelled it but it wasn’t overbearing! Very good recipe and I will make it again! The drippings were wonderful drizzled over the chicken and into the stuffing I made! This looks very delicious!! I have one question what type of parsley did you use? I like to use STAUB cooking wear for cast iron but there are a few others I have in my kitchen too. I like the larger of the pots so about a 8 qt is usually what I use. Can you make gravy from the drippings? How would you do that? I don’t have time to bring my 4 1/4 pound chicken to room temperature, nor do I think that s necessarily a safe practice! So I am allowing an additional hour before we sit down to dinner just in case the inserted thermometer does not read 165F after 1 1/2 hours in my lovely convection oven. it looks yummy, and all the things you suggest I know are perfect! Just a bit concerned about the doneness. I’ll let you know. I must be cursed. I cooked mine for 1hr 20mins. My chicken is pink still. Kristi did you preheat your oven? Put it back in and roast for a further 15-20 minutes. Could I do the same recipe with just thighs and legs? This was by far the best roast chicken I’ve ever had. One question: would this recipe also work for turkey? I think it will work great for thanksgiving. Yes, you will want to add time to the cooking so they are both throughly cooked well. looks lovely can’t wait to try ! Can it be prepared the before and bake on the day of my party? Yes, that sounds great! Enjoy your party! I made this tonight, using fresh thyme, rosemary, parsley, and savory from the garden. I took most the leaves off and chopped them into the garlic butter (cut it with high quality EVOO). Stuffed the stems inside, and roasted over a bed of veggies. It was on point. I used a salt-free seasoning, and once I processed the bird on the cutting board, finished with some pink salt from the grinder. Excellent recipe. I prepared this recipe last week using white wine and it was super delicious! I dumped a can of sliced mushrooms to roast as well and although they turned crunchy from too much heat, they were infused with flavor and were still quite tasty. Buttery mashed potatoes and whole green beans topped this meal off to be the best of the week. Will definitely make this again! my grandmother always used to make a killer roast chicken, this is as close as I have ever tasted. So so so good! I used dry sherry in place of the wine and I think the wine/sherry is the hidden ingredient! While my chicken is resting I remove the garlic half and put it back in the oven, this makes it softer. Spread that garlic on some sour bread….. thanks for the recipe, staying with me for years! Thank you for a beautiful roast chicken recipe. Made this tonight for my family and the kitchen smells divine. It tastes even better. That sounds so delicious! Cant wait to try it, but can you tell me how to get all the juices under the skin? Thx!! I will not roast a chicken any other way now, and no i definitely did not miss the gravy. This was so good, followed the recipe to a T, with the exception that I trussed the chicken before baking. It was evenly cooked and perfectly moist, aromatic and infused with such simple fresh flavors! Can I make this with cut up Chicken instead of a whole Chicken? Can I make this in an iron skillet? Recipe looks a Delish! This is now my goto chicken recipe. Truly amazing flavor. I did alter a tad by adding half an onion into the cavity but otherwise exactly as written yields a nearly perfect bird. That recipe was AMAZING! So simple and delicious…my partner and I couldnt stop making mmm noises as we were muching away. We will defintely be making this again ? Pardon my ignorance. Do I break the head of garlic apart and stuff the cloves in there, or do I just stuff an unpeeled head of garlic in there? Yes, you will want to stuff the head of garlic that is roughly peeled and cut in half horizontally. Hope that helps! You can’t go too wrong with this chicken! It will come out Devine! Thanks for following along with me! Could this recipe be used if I was to use a slow cooker? If so, any adjustment to be made? Yes, of course! You are welcome to adjust any of my recipes to your liking. Hope you enjoy your chicken! Do u cover with foil n put it in? No, you will cover it at the very end. Hope that helps and you can enjoy this tasty chicken! Thanks so much for following along with me! This is the best Roast chicken I’ve cooked or eaten. It was so flavorful and juicy. My family didn’t leave a morsel. I’ve been on the hunt for the perfect roast chicken recipe for years. Yes, years! Well, this is the one. It is simply divine – crispy skin, juicy inside, and to-die-for lemon-garlic pan juices. Yum! YAY!! That is exciting to hear! Thanks so much for following along with me! I will try this two days from now. And yes, in our house, there are fights over crispy skin. Try frying a turkey! You will have lots of volunteers to help cut up the bird for serving, trust me! I made this last week and my family loved it! They commented on the flavor and the crunchy skin. I made it without the wine and it was perfect! 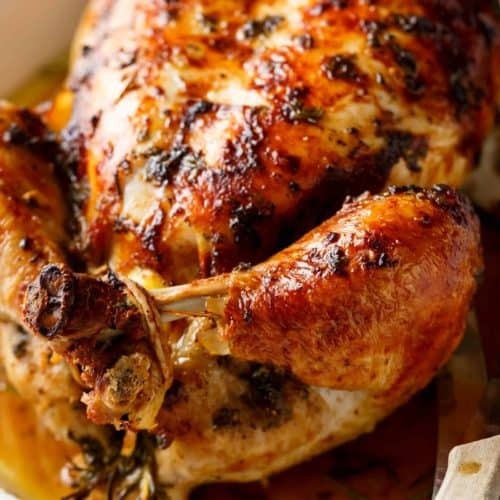 hmmmm is fantastic i like e roasted with garlic butter, rosemary, parsley, lemon rotisserie chicken beautiful colour,Full taste this recipe was simple and delicious!Those look so perfect! Thanks for the recipe! This looks mouthwatering! I can’t wait to try this! Can you cook this in a slow cooker? Hi Allie! Yes of course!